Faced with outrageous tuition-fee hikes resulting from the financialisation of universities, California's students are agitating for the first time in years. But is there more to these mobilisations than the limited fight for a decent and 'affordable' education, asks Evan Calder Williams. Everything I wish to own becomes opaque to me. In California, over the past six months, the struggle to ‘defend public education' has become something very different. 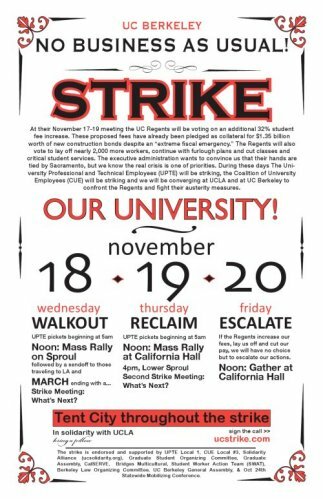 On 24 September 2009, thousands of students, staff, workers and faculty across the University of California (UC) system walked out in protest of fee hikes, layoffs, furloughs and cuts to departments and services. At the end of that day, a group of students and teachers entered the Graduate Student Commons building at UC Santa Cruz and occupied it for a week. The months to come saw a sequence of direct actions up and down the state, too many to detail here in this brief sketch.1 Later in September and October, there were study-ins, sit-ins and open occupations at libraries in the UC and California State University (CSU) system. In November, while the UC Regents met at UCLA to discuss - and ultimately approve - a 32 percent fee hike, as well as further cuts and layoffs, campuses erupted across the state, setting off an intense three-day wave of occupations, marches, sit-ins, blockades, demonstrations, arrests and shut-downs in Davis, Los Angeles, Santa Cruz, Berkeley, Fresno and San Francisco. Students are holding assemblies and arguing about what to do and how, dropping banners that declare WE ARE THE CRISIS, angering some, inspiring others. They throw dance parties in common spaces and wear masks to hide their faces. They write anonymous texts and analyse together. They make demands they know won't be met, and they refuse to make demands. There are solidarity marches in New York City and Vienna, two cities where university occupations before and during this period furthered the sense of a general crisis, as well as an explicitly anti-capitalist response, that exceeds the particular ‘budget squeeze' of California. In December, students at San Francisco State University occupied the Business Building and renamed it Oscar Grant Memorial Hall after a young black man shot and killed by police a year prior. The ‘Live Week' at Berkeley, where Wheeler Hall was held open during the ‘dead week' before finals, ended when police came in the early morning and arrested the occupiers. That night, a group marched with torches to the Chancellor's mansion. In the new year: library sit-ins at Davis, arrests and police confrontations at a benefit party for prior arrestees in San Francisco, a street party and riot in Berkeley following an occupation, and tireless planning for the long anticipated statewide strike on 4 March and week of actions. The 4th was a day of massive marches, rallies, demonstrations, and occupations as students blocked entrances to their schools, made it possible for workers to join the picket lines, brought businesses to a halt, and spilled from their campuses into their cities and, in Oakland and Davis, onto the freeways. Instead, I offer a short set of thoughts around the potential connections between two ‘isations': financialisation, especially as it shapes the university, and communisation (a practice of communist measures of collectivity and secession from capital that doesn't wait for a communist revolution), especially as it has emerged in connection with the recent upsurge of anti-capitalist currents in California and elsewhere in the US.4 Above all, I look toward this in terms of what is ultimately a practical struggle to elaborate, and displace, a fraught dialectic between the transparency and opacity of contemporary capitalism. To claim that ‘financialisation' (the increased prevalence of producing ‘value' by passing capital through financial instruments and institutions) is an overarching structure that determines the shape of the university, especially in the UC, California State University (CSU) and California Community College (CCC) systems, doesn't require allegiance to a conspiratorial follow-the-money tendency. It's a fact, and one largely avowed by those who've helped steer the public education system here into the shoals. In July 2009, the UC Board of Regents - the corporate entity that governs the UC and through whose name the money flows - declared a ‘state of financial emergency', granted emergency powers to UC President Mark Yudof, and set in motion the most recent round of tuition hikes, layoffs, furloughs and cuts that augmented the general sense that the ongoing crisis of the public education's ‘value' had become an emergency, albeit one hastened by those very emergency measures. By all accounts, the worst is yet to come. Barring a near unthinkable change of course, the unmistakable air of anxiety across the state will find its suspicions more than bleakly confirmed this year and next: all reasonable estimates point toward further, and more severe fee hikes, lay-offs, furloughs, budgetary contractions, departmental closures, increased reliance on the higher tuition fees of non-resident students, fewer classes offered and more students packed into those classes. Yet one shouldn't dismiss the specificity of how ‘financialisation' feeds into this narrative of exception and the broader crisis of capitalist reproduction.6 We need to ask: how does it affect the university as such (and the positions of its students and workers), and how do these effects relate to the wider crisis of profitability behind the trend toward increased reliance on financialised capital? Underlying the litany of real and urgent concerns about quality of life and education lies a more diffuse problem, that of a tension and slippage between the transparent and the opaque, both as concepts that describe the operations of capital and as experiences of every day life that grapple with such operations.7 What do I mean by this? It's been shown that the extra capital raised by hiking student fees and slashing workers' hours will not go to alleviating the particular problems faced by those groups. Rather, these ‘cost-saving measures' were made at the behest of credit agencies so as to maintain a good bond rating and invest in ‘capital projects'8 : above all, construction of research facilities to bring building contracts, outside firms and a further push toward the envisioned privatisation of the system as a whole. Yet what's at stake here goes beyond both the fact that the intended projects (biomedical, military, etc.) are anathema to the ‘left' and that the situation demands individual students take out more loans, at a higher rate of interest, to allow the Regents to continue to borrow at a lower rate.9 Rather, it is a further extension of financialisation's basic move: the decoupling of monetary ‘cause and effect'. Or, in a different register, of capital invested to supposed worth gained. Obviously, this isn't structurally new in the least. What's new is the affective texture of it, the mode of comportment - that is, humiliation - required to deal with an apparatus of self-reproduction that so baldly flaunts its opacity. It obfuscates the tangled web, particularity its operations, but not their vast distance from the explicit reasons given for paying more and earning less. The problem isn't that almost no one ‘gets' the alchemical intricacies of contemporary finance, but rather that it won't let any of us forget the asserted fact of its unknowability. We're asked to peer in and to see nothing other than a procedural apparatus ‘too complicated to explain'. Nothing other than the dark echo of feeling cheated. Who can be surprised, then, that many of the demands put to the UC system, and the subsequent elation of some when it was announced that it would be audited, centre around that obscure object of desire hidden from public view: the budget. As if the curtain will be thrown back, light will shine through and all will become clear. As if we were still capable of surprise. But what's there to see anyway? This isn't to disavow the necessary work of untangling the rat's nest of money or the recognition that ‘spectral' operations of fictitious capital have profound effects, above all the loss of jobs and homes. But the opacity of financialisation is declarative. And we shouldn't trust either naturalised accounts of it, that it is the regenerative future of capitalism - the triumph of the immaterial and spectral, moving phantom capital across borders with ease - or that it is genuinely opaque and dense. For it is not the shape of a new mode of production or phase in capital: this brash and tenuous architecture of the present is ultimately a glass house. Not just the glass ceiling of foreclosed access, not just the glass floor between production and reproduction but an entire set of walls and barriers that hide nothing.10 We can't know all the arcane methods of its construction, but we can see straight through it. Mistaken for opacity is the warped, constant image refracted through it: the fact that it doesn't work, that this form of speculation and risk badly veils the older story of declining profitability and the total crisis of the system. It is an obstinate, hostile nothing that can't be known, because it isn't a regime of production itself. Only a set of relations, extractions and circulations erected over industrial capital's slow-motion failure. The ‘absent future' written of here in California isn't just a wintry metaphor to capture how it feels to be a student or worker confronting the years to come. It's the reality of a situation in which, as of January, 6.3 million Americans had been out of work for longer than six months, the California unemployment rate (12.5 percent) is the highest on record, and only 46 percent of those between the ages of 16-24 had jobs - the lowest since the count began in 1948. The absent future is doubly the end of seemingly profitable speculation on the future, and the end of work for increasing numbers of those made yet more desperate by the contraction of easily available household credit. Communisation, then, is also the end of work. Not a theory to be enacted but a set of experiments without end, not a project to be fulfilled but a rejection remade anew each time. It elaborates labour's negation, working out capital's collapse through the recognition that it can have no determinate collapse. No longer the thought of revolution per se, imagining we can shatter this glass house and build anew, or leave it behind for a phantom clarity of simpler things. Rather, this is the practice of occupying the house and painting it black, with unsure, messy, shared actions that test and stain the transparent forms of the present to better see where we stand.11 To stretch and strain past what is legitimate toward the possibility of having more in common than the fear of what's to come. That's the drift, anyhow. And it points us to the immediate question: is that really the case in California? Are these events of ‘real' secession and disruption able to subtract sites from the flows of capital through obstruction and the abolition of ourselves as students, workers, non-workers, radicals? Why is the set of thoughts around communisation suddenly visible in struggles here, along with new faces and stated anti-capitalist agendas in the midst of a struggle for affordable public education? Is this what communisation looks like? The most honest answer can only be: we really don't know. Not because we don't think about this, but because we haven't done this sort of thing before, and each time we try something, push further and regroup, forge new circuits of friendship or dissolve other patterns and allegiances, each time a text is written, a banner dropped, a door barricaded, the situation changes. We can rather simply answer the banal question of why all these ‘young people' in California are reading, and framing parts of this movement in terms of, texts associated with European ultra-left/insurrectionary anarchist trajectories - Tiqqun/Invisible Committee, Dauvé and Nesic, Théorie Communiste, Debord, strands of Italian autonomia, TPTG, so on.12 First, a question of personal transmission: these texts matter to a number of people who've been involved in the struggles here, and they've shared them with friends because they see them as relevant to the situation.13 Second, and perhaps more importantly, there is a nearly accidental consonance: the concrete situations analysed may be different, yet something echoes between, for example, an attempt to grasp the limits of anti-CPE struggles in France and the limits of education struggles here. But one shouldn't presume a naïve application of theory to a different context, as if a ‘how to communise the contemporary catastrophe' handbook was read and mutely applied. It is indeed a genuine tension to not become frozen in a glance to the East, constantly checking our sparks against what often seem like hotter fires on the Continent. And moreover, to find a mode of articulation that doesn't feel like rehash: my own writing and thinking is plagued by this difficult task of grounding itself here, on this terrain both too familiar to be noticed and too mutable, marked by every attempt to take hold of it. 1. Even moderate reforms - to education, to the patterns of finance and construction - will only be possible with mass disruption of ‘business as usual'. 2.The mass required for this mass disruption will only emerge through acts of disruption, in the shared experience of the general strike, the rent, tuition, and debt strike, the occupation, the street party, the sit-in, the walk-out, the auto-reduction, the wildcat, the riot, and the blockade. Not that such actions are magically transformative, producing this mass ex nihilo, or that such negations automatically articulate a ‘positive' content. And it's true that such actions, divisive and threatening as they can be, will create rifts in populations. But with those experiences and with these rifts come also the occasions for conversations before, during and after attempts to think things through which such a mass coalesces. It is the recognition that no amount of planning can tell us what will happen - and as such, what matters is to try - and ceaselessly try to situate ourselves again in a landscape formed of such trials and the inertial blockages they encounter. More starkly, the measure of success is the undermining of the category of success. In the contemporary climate, what would such a category even mean? To be sure, there are major gains to be made - concrete improvements to public education, better wages and conditions for its employees, networks of mutual aid and solidarity for those grappling most with debt and poverty. One of the senses of the slogan - WE WANT EVERYTHING - central to these past months, a slogan taken above all as a declaration to not settle for anything less than negation of the whole structural order, is also that we want everything along the way: we want workers to be treated fairly, we want school to be free, we want to never work, we want to learn without degrees, we want debt canceled, we want to bring it all to a halt so we can see where we stand and start otherwise. Because, crucially, there can be no end-goal: to speak of ‘insurrection' shouldn't be to speak of a far-off horizon to come, but rather a process of trying and testing, of leaving behind and digging in. Is what's happening here a successful start to ‘communisation'? Not in any determinate way measurable against some template or text. What's happened here, in the centre and on the periphery of a struggle over public education and financialisation, isn't anything that looks like full appropriation and redistribution of materials, and it isn't the full secession of pockets of friends and comrades from the circuits of work and school. But like the moments in Vienna and Athens, Zagreb and New York, Mexico City and Marseilles, this is on our own terrain and our own terms, terrain and terms we can't know other than through the experiments of our small breakdowns and flare-ups. It's an alternate cartography of California just getting started, and it can't be measured by writings from afar, or even from nearby. Rather, what happens keeps outstripping what was supposed to happen, as it's necessarily inflected by the particular settings and the context of emerging from the university to push toward other grounds. Old tactics and slogans are used differently, and new ones stumbled upon. And, appropriately, with a very West Coast bent to it all: dance party becomes open code for illegal occupation, and during a riot in Berkeley, a few ‘ghost ride the whip', the Bay Area hip hop-derived practice of dancing on and alongside a driverless car as it moves ahead in gear. Goofy, sure, but also a distinctly Californian figure of communisation, at first glimpse, a homegrown critique of the financialised present.14 The auto lurches forward, there's no driver at the wheel, no direction or reason: for we have got out. No longer stuck in deadlocked traffic, not guarding from within the sanctity of the leased vehicle, not just waiting for the crash to come harder, not trudging home, but out there, taking pleasure together with others who know this can't go on. From the glass house to the empty car, learning how to take and make shelter otherwise, leaving the motor wheezing as we join each other in the street. How does this end? We can't know. But there's only one way to find out. 2. A clarification about these thoughts: unlike the majority of the texts and statements from the past six months, this isn't anonymous or from an autonomous collective. It doesn't aim to represent the movement as a whole, or even the ‘ultra-left' current of it. (Neither have the other writings emerging from collectives and committees, groups of friends and strangers brought together: to claim that they misrepresent others involved is to miss the point that they aren't interested in speaking for a ‘movement', only for a passing moment and an attempt to situate it in its passage.) That said, the thoughts that follow are not ‘my own'. They are inflected, to be sure, by my tendencies, but I have no proprietary relationship to them: if anything, they are a brief, incomplete crystallisation of countless conversations had and overheard, arguments made in private and printed en masse and, above all, instances of acting. 3. I strongly suggest two documents that do so more ably: Will Parrish and Darwin Bond-Graham's ‘Who Runs the University of California? ', on the financial structures at work in the UC system, and the newspaper, After the Fall: Communiqués from Occupied California, which includes key occupation texts from the fall plus new writing that both recounts and covers new ground in elaborating the ‘ultra-left' perspective. 6. The public education system, we should add, of the state which itself constitutes the 8th largest economy in the world. 7. To take a few: the inability of workers to make a decent living wage, students working and borrowing more to pay back for an education with fewer and more crowded classes, whole departments going under, increased emphasis on aspects of the education sector able to bring in private research dollars, the infamous rise of precarity for graduate students and lecturers. 9. Again, one need not be a historical materialist to see something very wrong, and justifiably rage-inducing in such a laid-bare state of affairs. 11. A longer issue, taken up in part two of this essay, is how to relate this figure of the glass house to older legacies of revolutionary movements. Walter Benjamin, commenting on Breton, wrote that ‘to live in a glass house is a revolutionary virtue par excellence': in that sense, it was a triumph of publicness and shamelessness over bourgeois notions of the domestic and private. Yet the contemporary tendency toward a language of the invisible and of the opaque signals not just a rhetorical preference but also a registration of a profoundly different political-economic situation. 12. For example, one could surely prove, with hard data, that the phrase ‘human strike' is uttered with far more frequency than six months ago. 13. Relevant, in part, as other instances of attempts to think about an ‘anti-politics' fundamentally opposed to representational governance and also aware of the limits of more traditional articulations (parties, unions) of worker power, particularly in the contemporary moment. 14. As a friend put it pithily in an off-hand comment, Communiqué from an Absent Driver. I think this is an interesting article, but would make the same criticisms as I would of the Tiqqun/Invisible committee arguments about 'communisation' - it tends to obscure much more than it reveals, as opposed to say, making arguments about increasing student/worker consciousness and combativity through struggle, which could easily be made about these struggles in this article. Especially as the argument is presented here, with the comparison of two different stategies towards the 'glass house' - which though a nice metaphor doesn't really tell you very much at all IMO. Firstly, thanks to the author for this piece. I enjoyed it and learned a great deal from reading it. Some thoughts/ideas: I was involved in the student protests, riots, etc. in Berkeley over this past year. One thing that I think is both thought-provoking and problematic is the tendency on the part of various folks to claim the "liberation of x." The occupation of Wheeler Hall, for example, was understood (by some at least) as the liberation of this space - meaning that, in some sense, it was rendered communal. I think this is misguided and that the assumptions it bespeaks should be recognized and criticized as the movement continues. In particular, I think claims to have "liberated x" (e.g. Wheeler Hall) are guided (at least in part) by the critique of the concept of "revolution" alluded to above. As I understand it, revolution is rejected by the author (among others) as a far-off and (perhaps) unachievable goal and fetish. To me, this position belies both (1) a genuine and laudable desire to avoid bogus theoretical articulations of revolution in favor of its lived experience but also (2) a tendency to think of moments of battle and conflict as (almost necessarily) moments of success. Although I agree with the first desire, I think the tendency to think of battle or conflict as in itself successful deserves criticism. In the case of Wheeler Hall, nearly everyone I saw outside was as dejected as they were jubilant when the occupiers left the building. People waited outside for more than an hour to hear or decide what would happen next... Occupiers were openly confronted and provoked for failing to assemble and failing to have easily identifiable means of communicating/deciding the next steps. In my opinion, this dejection stemmed not simply from the fact that we were ready for a fight (which many, many of us were), but also because we were ready to WIN. That is, we wanted, not to "occupy" the building, but to "seize" it - or at least to extend and escalate the conflict. Whereas occupation signifies the temporary presence of a militant alien force which itself intends to leave under some condition (thus the US is said to "occupy" Iraq), seizure signifies the expulsion of an enemy force from a contested zone or dwelling place which both parties intend to inhabit. Looked at from this perspective, I think, occupation itself should not be thought of as communization. It should be seen as a tactic the purpose of which is either to escalate toward seizure (hopefully the idea behind signs that read, for example, "occupy everything, demand nothing") or to win reforms (definitely the motivation of some of the students both inside and outside). Signs that a communal seizure of a space or institution has taken place include: autonomous decision-making among many different "constituencies," defensible common possession, redistribution of labor responsibilities, physical and symbolic removal of external authority, communalization of goods and spaces, the establishment of physical and symbolic boundaries, etc. Needless to say, most of these were missing at Berkeley and those that existed were designed to be temporary and could not defended against the police. As the author mentions, many tactics have a place in the broader struggle. Occupation has proven to be an inspiring and militant means of revealing the real contradictions of the present university system. Further, I tend to believe that means-ends thinking is generally misguided (particularly when applied to radical tactics and movements). Still, I think that even as we recognize that radical praxis must always offer glimpses into an unforeseeable future, we must likewise recognize that these glimpses are only momentary, vague and by no means the reality they portend. To borrow language (if not ideas), a situation merely exposes the spectacle, it does not destroy it.